My relative neglect of mistletoe over the last few months seems to have been to no avail. The canal book has taken too long, so we’ve just rescheduled it for next year – my deep sign of relief was followed rapidly by indignation that I’ve neglected so many other projects unnecessarily!! (though perhaps I exaggerate a bit). 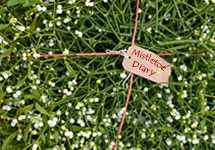 Anyway, next overdue mistletoe task is some promotional work on my Mistletoe Matters consultancy work – I will say no more here – go to www.mistletoes-r-us.co.uk for more info. 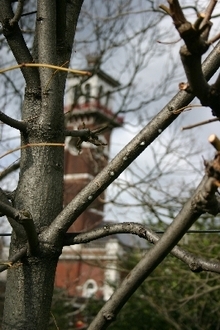 To Lambeth Palace, to plant mistletoe for the Archbishop of Canterbury. The Archbish wasn’t in, but he had given his blessing, despite the C of E banning mistletoe from inside churches (allegedly). Iain Boulton, the ecologist for Lambeth Borough told me that the Archbish was very keen on biodiversity and wanted Lambeth Palace Gardens to do their bit. 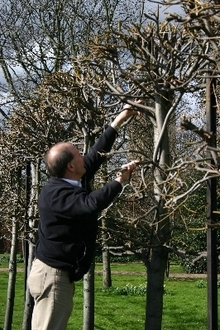 This exercise is, of course, part of the London Mistletoe Biodiversity Plan. 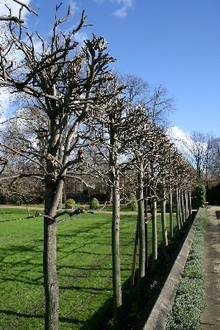 So Iain and I got on with it – starting with the pleached limes – a most suitable host, and one where, if the mistletoe grows, it will become a major feature of the gardens in years to come. The Lambeth Palace Gardens are ancient – this has been the seat of the archbishopric for many centuries, and we find a lot of suitable hosts beyond the limes – Robinia, Willows, Apples – all attract our attention, plus a few berries each. I do hope the Archbish does like mistletoe – he may have quite a lot. But he is called Rowan, and mistletoe is very fond of Rowan, so perhaps the relationship is pre-ordained. This pic shows some of the berries on a branch – I usually aim for 5 per planting, to allow for casualties.